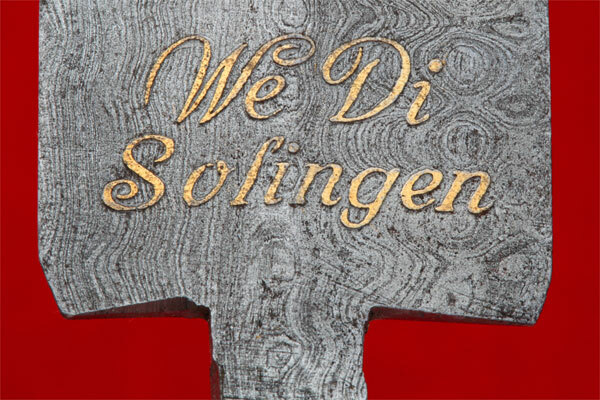 We Di Solingen: I was told this blade was made after the war by the damascus swordsmiths Wuster and Paul Dingler from WW2 scrapped or rejected blades. Dingler came from the Eickhorn factory. I am still researching Wuster (We). Maiden-hair was the only officially approved damascus pattern for high leader daggers. This blade therefore was made from spare parts. Blade: 22 cm, tang 13 cm., nice gold motto and maker mark, carbon stained blade, clipped edges where blade meets guard, tang ground on three sides in order to fit inside the grip, the quality is too poor to pass inspection. Original Eickhorn SA Leader blades are selling for 25K. This one is from an Eickhorn smith, possibly made from period parts, but who probably no longer had access to the factory parts and equipment to make a finished dagger. A good research project.